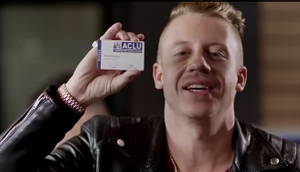 A screenshot taken from a video on the ACLU website, depicting a fervent ACLU supporter, the liberal singer Macklemore. The American Civil Liberties Union (ACLU) is a New York-based organization which provides attorneys and legal counsel for legal cases in which it believes individual rights have been violated. Their website boasts that they are America's "guardian of liberty". The organization is a member of the non-official anticreation lobby in the US government judicial system. The ACLU claims to be a defender of the rights of US citizens, but claims exclusivity over the Constitution to define homosexuality and abortion. The ACLU's supporters say it has been vital in preserving personal freedoms by fighting for the principles contained in the U.S. Constitution and the Bill of Rights, and while in some cases this may be true, the ACLU severely neglects the 1st Amendment, which provides free-speech for the Christian majority and instead insists on promoting that other religions are persecuted in the United States. Its critics say it has done more to promote moral decay in the United States than has any other organization, and it works feverishly to undermine the nation's Christian and moral heritage. However, the ACLU has been called up to protect the rights of Christians, as well, including the freedom of religion and free exercise, the freedom of speech to speak against abortion, homosexuality, etc. Ironically, the ACLU defends the rights of people to be verbal against things such as homosexuality, but it itself is staunchly in favor of it. The ACLU also believes that black people are treated worse than white people in public schools. Their source of these claims is the Education and Justice departments in the federal government. The ACLU has advocated that the federal government enforce 'training programs' for schools that are seen racially discriminating. The American Civil Liberties Union began in 1920. It grew out of the National Civil Liberties Bureau (NCLB) that lawyer Crystal Eastman and sociologist Roger Baldwin organized in 1917. The NCLB gave legal aid to conscientious objectors (those who objected to doing military service) and to those whom the government was prosecuting under the Espionage Act of 1917 and the Sedition Act of 1918. In a test case, the ACLU recruited Tennessee schoolteacher John Scopes to stand trial for having taught evolution in a public school. Scopes lost the trial, but the fundamentalist side, led by lawyer William Jennings Bryan, suffered ridicule that cost it much public sympathy. The ACLU has opposed creation science since the famous Scopes evolution trial of 1925. In this trial, the ACLU backed Tennessee schoolteacher John Scopes in defying a state law that banned teaching Darwin’s theory of evolution in state-funded institutions. In 1968, the ACLU argued in Epperson vs. Arkansas that Arkansas' ban on teaching "that mankind ascended or descended from a lower order of animals" was a violation of the First Amendment, which forbids official religion. Vigilance requires firm and consistent opposition to every effort to use the nation's schools to teach any biblical text, including Genesis, as literal truth, either directly or disguised as 'alternative' science. To reject creationism as science is to defend the most basic principles of academic integrity and religious liberty. The ACLU praised a court’s ruling on December 20, 2005 that struck down a school board’s decision in Dover, Pennsylvania, to teach intelligent design as an alternative to evolution. The ACLU led the legal challenge in the case. There is a long history of the ACLU's opposition to Judeo-Christian values representative of biblical pinciples, which the United States was built on. In 1992, in the case Lee vs. Weisman, the ACLU said including a prayer at the beginning of a public high school graduation ceremony violated the Establishment Clause. In 1945 the ACLU opposed laws requiring prostitutes to submit to examinations or vaccinations, saying these violated the women's rights to "medical liberty." ↑ About the ACLU American Civil Liberties Union, Accessed January 10, 2014. ↑ 3.0 3.1 3.2 "The Successes of the American Civil Liberties Union". American Civil Liberties Union. This page was last modified on 24 July 2016, at 17:38.